Republican Sen. Chuck Grassley upbraided Democratic Sen. Sheldon Whitehouse over a tweet Whitehouse sent earlier this month. The tweet implied that the Senate Judiciary Committee’s investigation into Russia’s election interference – a probe Grassley oversees – had been improperly influenced by President Donald Trump. The back-and-forth between Grassley and Whitehouse is the latest example of partisan infighting among the congressional committees investigating Russia’s election interference. Republican Sen. Chuck Grassley sent a letter to Democratic Sen. Sheldon Whitehouse on Wednesday, upbraiding Whitehouse over a tweet earlier this month. The Democrat’s tweet suggested the White House had pressured the Judiciary Committee, which Grassley chairs, to shift the direction of its investigation into Russia’s interference in the 2016 US election toward Hillary Clinton, the Democratic presidential nominee. Whitehouse had circled a paragraph from a New York Times report that said President Donald Trump had asked a Republican senator to examine Clinton’s relationship with the opposition-research firm Fusion GPS, which hired Christopher Steele, a former British spy, to research Trump’s ties to Russia. Grassley was not named in the report, and Whitehouse did not identify him by name in his tweet. But Grassley is among those who have called for a second special counsel to investigate the Clintons’ relationship with Russia and raised questions about who paid Fusion and why it has never registered as a foreign agent. “Your insinuation is baseless,” he told Whitehouse in the letter. 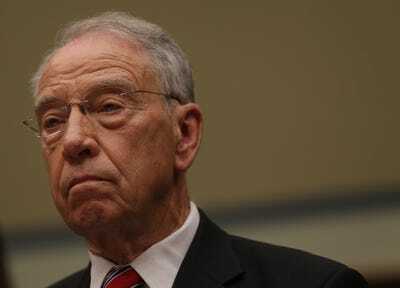 Grassley added that his “concerns about Fusion GPS’s role in creating and disseminating the dossier” – a collection of memos in which Steele detailed what he said were ties between Trump and Russia – “were not prompted by any outside source” other than a Washington Post report published in February that said the FBI attempted to pay Steele to continue his work. In a statement to Business Insider, Whitehouse said he had spoken with Grassley about the tweet. “I totally accept his statement that he was not the ‘nudged’ senator. That still leaves the question of who was. And we still need to act to defend our elections,” Whitehouse said. Fusion GPS is fighting the House Intelligence Committee over a subpoena for the firm’s bank records, which Fusion’s lawyers have argued was issued for political purposes. They included a copy of Whitehouse’s tweet as evidence that Republicans were investigating Fusion in bad faith. The Judiciary Committee’s chief investigative counsel, Jason Foster, asked Fusion to amend its filing to reflect the fact that Grassley had pushed back against Whitehouse’s tweet. The back-and-forth between Whitehouse and Grassley is the latest example of partisan infighting among the congressional committees investigating Russia’s election interference. The Senate Judiciary Committee’s top Democrat, Sen. Dianne Feinstein, recently began sending letters to witnesses requesting new documents and interviews related to the investigation into whether Trump’s campaign colluded with Russia. Grassley has not signed off on the letters, all of which have been made public by the panel’s Democrats. Nor did Feinstein sign off on 13 letters Grassley sent in October seeking more information about an FBI agent named Peter Strzok, among others.